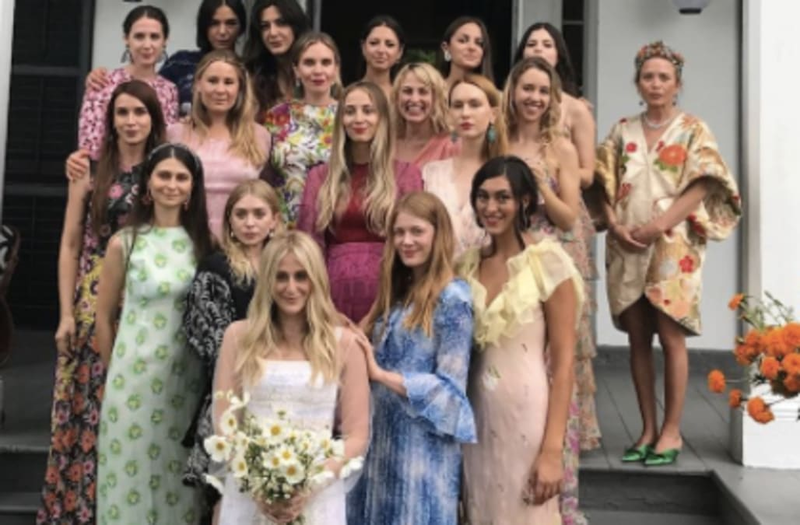 Mary-Kate and Ashley Olsen found a way to incorporate their unique style at a close friend's wedding on Saturday, rocking a floral theme as only they can. The 31-year-old twins served as bridesmaids at Gomelsky creative director Cassie Coane's wedding to Jim Koenig in New York City, supporting their longtime gal-pal. Coane's 18 bridesmaids all wore floral to the ceremony, making for a colorful group pic. Not surprisingly, Mary-Kate stood out in a voluminous cream-colored robe, green mules and a dramatic braided updo, while Ashley wore her signature black. Still, Ashley managed to make her own style statement thanks to the puffy, printed sleeves on her LBD. In a video from the wedding, the usually stoic twins also smile big while clapping for the bride. In April, Mary-Kate and Ashley attended a ballet gala in NYC, looking chic in floor-length black and white looks.